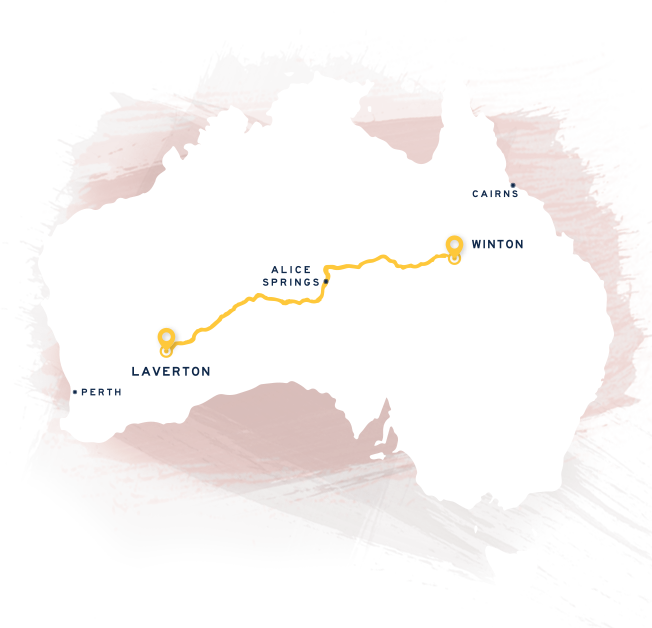 From Laverton, Western Australia to Winton, Queensland, via the Northern Territory’s Red Centre, The Outback Way, carves a well-worn 2700km track through the heart of Australia. The Outback Way is Australia’s Route 66, the great Australian Road Trip… unearth the magic and immerse yourself in a journey like never before. It’s a road trip that lets you sink into the peaceful colours of the Australian Outback, where your odometer collects memories with every kilometer. Whether you are zig-zagging the nation or you want a shorter invigorating getaway to awaken your senses -you’ll marvel at nature’s diversity, feel the cool waters in shimmering gorges wash over you, be inspired by the unique architecture of every mountain range, and hear the desert oaks whisper in their majestic forests. Immerse yourself in Indigenous culture, pioneering heritage, follow the Art Trail, get into the country spirit of an outback festival, and enjoy the outback hospitality at every town you pull into. All the places along the Way to discover: each town and the places in between. You’ll find details on attractions and things to do, amenities for travellers, accommodation choices, where to find visitor information, and links to local tourist websites. .
Let the landscape surprise you. Seek out treasures on the world’s longest treasure hunt. Absorb the richness of Indigenous culture, the courageous explorers and inspiring pioneering spirit . There is much to explore in nature . Meet the locals at Outback events. Experience the time of the dinosaurs. And be captivated by the diversity or Art and Artisans. Immerse yourself in the heart of Australia! Order the essential Outback Way Atlas &Guide with in-depth coverage of the whole route including places off the beaten track that are a must see as you journey through the heart of Australia. Plus find geocache starter kits, carbon offsets and tyre cover souvenirs in our store.